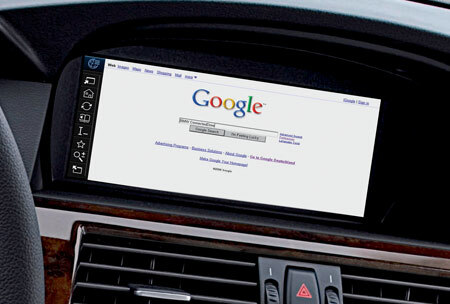 BMW dashboard equipped with Google search access. There was a time when in-car internet access was part of some SXSW nerd’s wildest dream. BMW has transformed that dream into reality. As part of its ConnectedDrive – the German car maker’s patented intelligent network that links the driver, vehicle, and surroundings – the dashboard of the new series of BMWs will be outfitted with un-restricted access to the Worldwide Web. The service – unveiled at the annual Geneva Motor Show which raps today – not only offers unrestrained access, but entrance to the inetrnet portal at fairly high speed. The world’s largest car maker says net navigation will be powered by the same technology that gives Apple’s iPhone a leg up in the mobile market, EDGE or Enhanced Data Rates for GSM Evolution. Although EDGE is not as fast as the 3G Connection, the automaker, which is already ahead of in-car wifi technology with its Google local navigation system, says BMW drivers will be able to surf, send and receive e-mails, and carry out online banking transactions on the fly. The company plans to keep its current iDrive dashboard user interface, where the iDrive Controller, located close to the gear stick, will continue to serve as a mouse substitute. The display presents web pages in high resolution and has the capability to play embedded media like flash videos. A special BMW server transmits websites to the vehicle, which, according to BMW, “ensures optimum presentation on the display.” Additionally, if the vehicle is frequented by more than one drivers, personalized starting pages may be set-up by simply registering each user in the system. As expected, the small matter of safety arises once the auto-maker announced its intentions to continue pioneering web mobility for its customers. Some fears are allayed when the marketing architects at BMW promise the public the add-on is disabled when the car is in motion, beginning at 5km/h, and grants access only when the vehicle is parked. Passengers in the rear, however, will not face barriers to their internect connectivity as the same configuration attendant to the vehicle’s TV/DVD console provides limitless entry to the web whether or not the car is motionless. But everyone knows drivers will hack the system and have unbridled access to the net while zipping past 80km/h on the 401 and Florida Turnpike. It is just not enough to link Facebook to one’s blackberry or all eleven e-mail accounts, spanning half a dozen domains on your iPhone. There is that one person, who will not be able to wait until he gets to the office to pay his fee for direct internet access to the web from his BMW. Thankfully, for a tiny premium of about twelve Euros per month, the service is available come year end, exclusively to the European market, where drivers are responsible enough to face the consequences of their callous disregard for the safety of others on the road by using the autobahn.